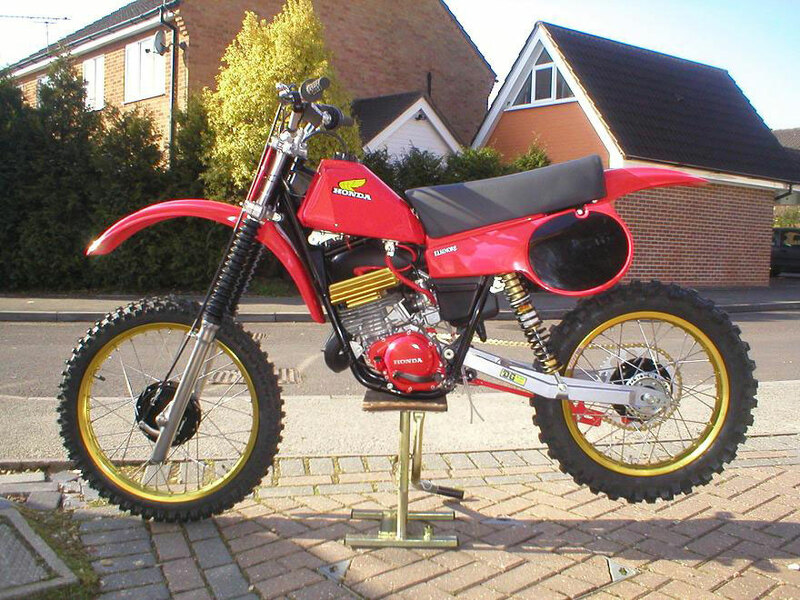 This is my 1980 Honda Elsinore CR125R. A friend of mine made The tank for me. If anyone wants one I can get some more made. The rims are Barrani rims not Excell. I went for something different. The seat cover was an ebay item, and the swingarm came from the USA, not sure what it is. A friend of mine said it may be a Kelvin Franks arm. I also have a set of billet yokes to fit, maybe Franks also. All engine work I do myself so I know it is right. I like to do my own. Then I can only blame myself of it goes wrong. The rear shocks came from Falcon shocks in the UK, that is where I live. They were new, frame was blasted and powder coated at Powder Pot in Blandford UK, plating was done at Ferndown Finshing in Dorset. I recon it took me around 80 or so hours, on and off. You have got to push yourself to get on with it or you just dont get it done, hence another unfinshed project. The tail pipe was Pro Form. I would of used the front pipe from Pro Form. but it does not fit. It is a long way out. I intend to race the bike if I ever get around to it but knowing my luck I would trash it first time out, I made this bike up out of bits and pieces I had lying around and a few I sourced from a few people I know.